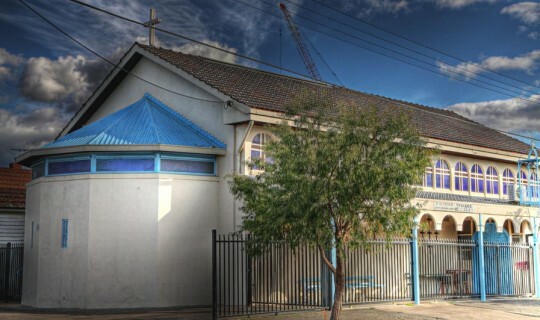 The Holy Church of “Holy Trinity” at Footscray was the second church erected by the Greek Orthodox Community of Melbourne and Victoria (GOCMV), after The Holy Church of the “Annunciation of Our Lady”. The decision to erect the church was a result of numerous requests by Community members living in the area. The discussions in regard to the construction of the church began in mid-1959. During the course of discussion by the Board of Management in the months of June and July 1959 numerous recommendations were made for the purchase of an appropriate allotment of land. Specifically, during the Board of Management meeting of 27th July 1959, the then President of the GOCMV, Mr. Vassilis Logothetis mentioned that the Board must carefully consider the purchase of land and the erection of a church at a central Footscray location. In accordance with the Board of Management minutes, a subcommittee of GOCMV members that resided within the suburb of Footscray was established for the purposes of locating the appropriate land, erecting the Holy Church and raising the required funds. The Board of Management appointed Mr. E. Vlassopoulos and Mr. T. Marmaras as the responsible Board Members for securing for the required loan and that the following members were to assist the ‘Footscray subcommittee’, those being: Mr. E. Vlassopoulos, Mr. D. Elefantis, Mr. G. Agathagelidis, Mr. G. Nikakis and Mr. S. Gavrilidis. At the GOCMV Board of Management meeting held on the 29th December 1959, the President noted that the Footscray Subcommittee “has found the appropriate land for the erection of the Holy Church and for an after-hours Greek school”. The value of the land that was sourced amounted to the sum of 4,250 Pounds. As part of the discussion Mr. D. Elefantis recommended that the adjacent property, 2 Leeds Street, should be purchased and that it be used as a school. The discussions in regard to the purchase of the properties continued and at the Board meeting dated 15th February 1960, the then Secretary E. Vlassopoulos presented to the Board of Management the contract of sale that included an exit clause stipulating that if the local Council did not approve the construction plans, the contract would be void. Council approval for the erection of the church was soon after granted and the sale of both land and house were secured. The Board appointed Mr. K. Sofianos, in its meeting on the 31st July 1961, as the preferred architect of the project. The estimated cost for the construction was estimated at approximately 20,000 Pounds. The construction of the church was completed with some delays and with the financial assistance of GOCMV members and parish members. The church began to operate in 1962, with the first priest being the Reverend Stylianos Aivaliotis.